If Microsoft follows the same schedule it did last year, the Spring system update for the Xbox 360 should be right around the corner. Today, an alleged and wholly unconfirmed list of changes included in the "Q2 2008" update was sent to us, supposedly forwarded from an internal source. The full list—which is after the jump—features about 80 new feature additions, tweaks and changes but was purported to be incomplete and subject to change. Some are simply interesting as curiosities, such as an option to purchase Xbox Live memberships for charities and the addition of a Media section for audio delivered through feeds, such as podcasts. Others sound more feature robust, such as Windows Live Mail integration and an expanded "Inside Xbox" with news, weather, entertainment, help and community features. Perhaps the most interesting additions are "Calibration options for motion sensor devices" for the Dashboard and "Support for titles to store installation data on Storage Device for faster loading" for Games. If true, the former would lend further credibility to frequent rumors that Microsoft is planning to introduce a motion controller for the Xbox 360. The ability to store installation data on a hard drive—as is done with some PlayStation 3 games—would certainly be a welcome option, if that's how the wording should be interpreted. Continue on for the full list of rumored updates. 1. Option to delay sign-in to Xbox LIVE upon booting console (to allow user to set Online Status). 2. Option to promote Child Account from Family Settings. 3. Disallow Child Accounts (over 18) to override Family Settings by launching Privacy Settings through a title. 4. Option in Family Settings for Child Accounts to enable child-oriented/non-mature advertisements. 5. Introduce a group chat (4) for Private Chat and conferences through Video Chat. 6. Support to indicate media being watched to gamercard status (video content from Marketplace only). 7. Extend height for Bio field in Personal Profile, easier navigation through text. 8. More fields present in Personal Profile - recent achievements, interests, games, movies, links, custom section. 9. Compact Personal Profile for new fields (navigating to field will open it up). 10. Mandatory option to delete duplicate titles from gamercard (excludes Games for Windows - LIVE). User disconnected from Xbox LIVE when booting any title until action complete. 11. Option to remove payment information from gamertag. 12. New payment methods for international users. 13. Download History on Account Management better organized - games, genre, type, download date, miscellaneous. 14. Long descriptions of items on Marketplace can be scrolled using right stick. 15. Better organization of free content on Marketplace. 16. Option to 'ping' when testing connection. 17. Allow re-connection to Xbox LIVE if Ethernet cable is re-inserted whilst powered on. 18. New strip colors available to developers, staff gamercards. 19. New corner icon available to ambassadors. 20. Re-introduce Messages button for Inside Xbox updates only. 21. Option to store up to 10 messages permanently on server (excludes invites, status messages). 22. Increase character limit for text messages between friends only. 23. Option to disable invites from non-friends or all players. 24. Option to disable invites from titles not on gamercard (excludes demos). 25. Option to have smaller items moved up in Active Downloads. 26. Automatically re-connect to Xbox LIVE if disconnected unexpectedly (set intervals). 27. Option to download gamer picture (if available) from a gamercard being viewed. 28. Display random tips to replace static text on Xbox LIVE and Games blades. 29. New button on Marketplace for optional dashboard features - uses Storage Device memory. 30. Option to donate Microsoft Points to anybody with a Windows Live ID. 31. Option to purchase Membership for charities (includes benefits). 32. Integrate file-sharing for selected titles on Xbox LIVE and Games for Windows - LIVE. 33. Disable notifications to friends of user repeatedly signing into service (set period). 34. Option to see 'snippet' of text message in notification. 35. Windows Live Mail integration - includes support for Xbox LIVE Vision. 36. Web feeds integration - text, images, audio. Includes support for specific item codes on Marketplace. 37. Option to display gamer picture or standard picture as display picture in Windows Live Messenger. 38. Support for headset, Xbox LIVE Vision in Windows Live Messenger. 39. Support for limited 'winks' that display on dashboard interface. Option to disable 'winks' and 'nudges' added. 40. Notifications separate from Windows Live Messenger to Xbox 360 notifications. 41. Disable multiple languages from being used in any Xbox LIVE editable fields. 1. Option to delete titles from gamercard with 0 gamerscore and 0 achievements (excludes some titles that will be re-added to launch another title). 2. Organize My Games at the Games Library section better (includes disc-based titles) - sort by genre, platform (Games for Windows - LIVE), percentage completion. 3. Support to display friends leaderboards for disc-based titles. 4. Show dates of an achievement unlocked when comparing. 5. Preload Games Library upon dashboard bootup for faster access. 6. Game updates now shown as items in Memory, increased amount of updates on Storage Device. 7. Option to delete game updates, removed 'cheat code' as no longer needed. 8. Support for more titles to display banner when accessing guide in-game. 9. Option to re-introduce awarded gamer pictures from titles that do not have their own re-introduce feature (requires saved game). 10. Disable gamer pictures from being awarded from trials. 11. Support for titles to store installation data on Storage Device for faster loading. 12. Synchronization to achievements offline/online that were deleted and then re-added from developers. 1. Option to hold LT and RT for rewinding/fast-forwarding video content. 2. Option to delete individual music tracks from storage device. 3. Option to rip music CD at different quality. 4. Copy non-protected files (pictures, music, videos) from USB storage devices, CDs and computers to proprietary storage devices. 5. Support for menu, top-menu features on video content downloaded from Marketplace. 6. Section added for audio delivered through feeds (podcasts). Option to stream, download to Storage Device. 7. Support added for video titles/description to gamercard status. 1. Option to navigate quickly out of several menus back to respective blade home (applies to Games, Media, System). 2. New blade trim styles added. 3. Introduce expanded Inside Xbox as a portal to news, weather, entertainment, help and community features. 4. New sounds for various functions (notifications, blades, navigation). 5. Calibration options for display/sound. 6. Calibration options for motion sensor devices. 7. 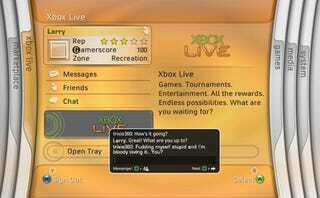 New effects for Xbox LIVE Vision and dashboard background. 8. Disable changing of Theme when on Memory to prevent 'hanging'. 9. Preload recent, limited items upon dashboard bootup on Memory. 10. Faster loading of Themes section on guide. 11. Option to see what items will not work offline due to DRM license changing from Memory. 12. Option to automatically associate new DRM to items downloaded for free. 13. Indicate 'charging' status on guide when Play & Charge kit is connected. 14. Option to change text colors on guide to better contrast some backgrounds. 18. Word censor updated for fields. 19. Privacy Settings/Family Settings updated for new features. 20. Voice, picture messages can be read at Xbox.com (Gold accounts). When we contacted Microsoft to verify the authenticity of the list, we were told "We don't comment on rumors or speculation, but what we can tell you is we've never seen this list before." Obviously, consider this rumor and/or speculation for now, especially in light of the official statement and the clearly unofficial sourcing of this information. If we hear anything more concrete, anything straight from the source, we'll let you know.